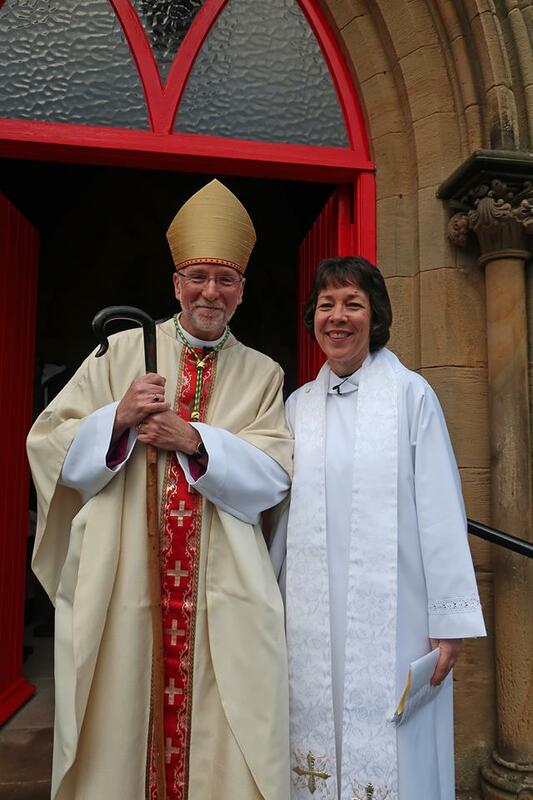 The church was packed full last Saturday for the institution of Revd Nerys as our Rector. Members of the congregation, staff and pupils from St Mary’s School and representatives from the other local churches and organisations in Dunblane joined with priests and lay people from churches all around the diocese for a memorable service led by Bishop Ian Paton, the new bishop of St Andrews, Dunblane and Dunkeld. In the church hall afterwards Nerys was greeted in song by members of Young Church and was presented with a celebration cake decorated with Welsh dragons and thistles. Nerys, who has lived in Dunblane for over twenty years and was active in the church and the community as a lay minister before going to St John’s Church in Perth three years ago to train as a priest, was welcomed home to St Mary’s by John Owen on behalf of the Vestry, by Monsignor Basil O’Sullivan on behalf of the Dunblane Churches and by Sam Toop on behalf of St Mary’s School. Nerys responded by expressing her surprise and delight at being called back to St Mary’s as Rector of the congregation.